Sophsterlicious • UK Blog: Too Faced Lip Injection. Is it possible to get a fuller pout without any surgery? We can all try and fake it, with a bit of lip liner, like Jodie Marsh p'raps? What I am actually talking about is lip plumping products, do they work? Enter 'Too Faced Lip Injection' Products. I bought these a while ago now, and they're not cheap, but I must have been in some kind of mission for a fuller pout at the time, I can't really remember to be honest. I remember the first time I tried the 'Lip Injection Extreme' - I was in a department store and tried some out, It stung and felt funny, and after a while my lips looked much fuller, My boyfriend said at the time that I looked like Pete Burns?! I think he was over reacting.. So, I purchased it from boots a while after. It costs £17.00 which I think is rather expensive when I think about it now. But I do think it makes my lips fuller! What do you think? I think there is a difference, although not massively. It is advised that you use it morning and night to get results, but the picture above was taken about five minutes after one application. I don't use it religiously, just if I remember. It tingles for a few minutes, feels almost burning like most plumpers, and then it stops - then you can apply your lipstick and go about your day. The packaging is cute and it has a brush applicator. The serum itself is like an iridescent clear substance that is fairly thin, but leaves quite a nice sheen on your lips, even after the tingling stops. My lips always feel really smooth and soft after using this, and makes lipstick application smooth too. Then, to further extend the lip injection family you can buy mini lip injection glosses (not 'extreme') ones. These are coloured and can be applied throughout the day to perk up your pout. So these can be used in between your morning and evening applications of the 'Extreme' to keep your lips full. They also work, but not as well as the extreme serum. These have a sheer shimmery colour to them and are quite thick, but apply nicely. I think they retail for about £8/£12 each, but I found them here on Amazon for £4.99 each. 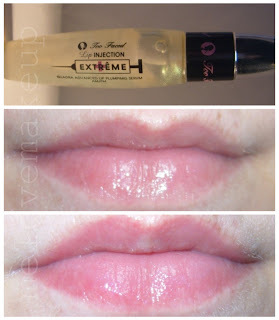 The 'Extreme' Lip Injection can be purchased in Boots, for £17.00. Have you tried any of these products, and do you see a difference in my before and after shots? I can't cope with lip plumpers, they all make my lips burn so much i can't cope with it. I remember you used to be able to get some sort of lip plumping mask from Too Faced, which was intriguing. I do think it made a bit of a difference. I'm always on the lookout for lip plumpers and my favourite is Miss Groovy's Lip Poison - it really works but it stings a lot (I don't mind as I know it's doing something then!). I must do a little review of it.